With tick season in full swing, we are seeing a large number of patients with new tick bites and questions regarding tick prevention, tick removal, and ways to have ticks tested. Please carefully read the information contained in Dr. Horowitz's recent Facebook post and these documents. Please note that tick repellents do not kill ticks. The longhorned tick or bush tick (Haemaphysalis longicornis) appeared in NJ last year. This asian tick mysteriously turned up on a New Jersey sheep, and was confirmed to have survived the winter in NJ. It now has been reported in West Virginia as well. The tick has been associated with a phlebovirus, called the SFTS virus, which is an emerging hemorrhagic fever discovered in China (other tick-borne phleboviruses, such as the Powassan virus, are spreading here in the US), and it also has been associated with the alpha gal meat allergy in other parts of the world. Severe Fever and Thrombocytopenia Syndrome (SFTS) is not new, and recently led to the death of a Japanese woman. The major clinical symptoms are similar to other tick-borne viral infections such as the Bourbon and Heartland viruses in the Midwestern US, and include low white cell counts (leukopenia), low platelet counts (thrombocytopenia) and G.I. manifestations (elevated liver functions, i.e., transaminitis) with associated fever, vomiting, diarrhea and multiple organ failure (Yu XJ, Liang MF, Zhang SY, Liu Y, Li JD, Sun YL, et al. Fever with Thrombocytopenia Associated with a Novel Bunyavirus in China. N Engl J Med. 2011 Apr 21;364(16):1523-32.; Lam TT, Liu W, Bowden TA, Cui N, Zhuang L, Liu K, Zhang YY, Cao WC, Pybus OG (2013) Evolutionary and molecular analysis of the emergent severe fever with thrombocytopenia syndrome virus. Epidemics 5(1):1-10). Alpha gal meat allergy is due to an allergic reaction secondary to the bite(s) of ticks (usually the lone star tick, Ambylomma americanum in the US), where individuals can get delayed anaphylactic reactions several hours after eating meat. Sensitive individuals can get an anaphylactic reaction, with hives and swelling, shortness of breath, low blood pressure (hypotension), vomiting and diarrhea 3-6 hours after eating the offending food. Triggers include not only beef, but also pork, lamb, venison, goat, and bison. It can also can be triggered by animal-based products containing gelatin. • Wear permethrin treated clothing (take the clothing outside and spray it (not while wearing it) or buy permethrin treated clothing; put IR3535 (Avon SSS) or picardin on the skin (lemon eucalyptus oil can also be helpful as a natural product), or 20% DEET if in a high risk area. • Do frequent tick checks, while properly removing ticks to prevent transmission. Place clothes in the dryer on high heat after coming inside (for at least 6 minutes) will also help kill ticks. 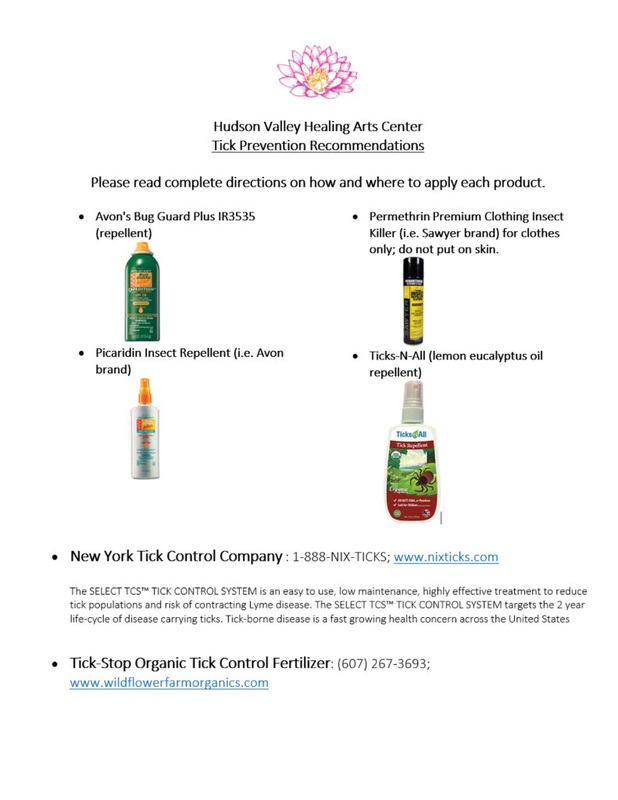 • Finally, tick prevention integrated pest management approaches may be helpful to reduce exposure in your yard and garden (companies like NY Tick Control can evaluate your property and evaluate the risk/benefit of spraying, bait boxes, etc). Stay safe during the warmer weather. The ticks are out in large number! Avoid high risk areas (high grass, edges of woods..); Wear protective clothing (permethrin kills ticks; take your clothing outside and spray it with permethrin, let it dry, and it will offer protection for up to two weeks; or buy permethrin treated clothing), use tick sprays (such as IR3535 and picardin which safely repel ticks, lemon eucalyptus oil also has some proven efficacy), and do frequent tick checks when outdoors. Immediately remove a tick if found (get underneath it with a tweezer or tick removal device) and contact your primary care physician for advice after a bite. The tick can be saved in a baggie with a blade of grass, or vial with alcohol, and sent to a local laboratory for tick and pathogen identification. Tick bites can transmit certain bacteria and viruses in as little as 15 minutes, with engorged ticks (attached for greater than 24 hours) having a much higher risk of transmission of Lyme disease, although cases have been reported within hours of a bite. Therefore, act quickly and contact your health care provider after a tick bite, especially if you experience any new physical or mental symptoms. Suspect Lyme disease if you experience sudden unexplained fatigue, migratory pain (joint, muscle and/or nerve pain), memory and concentration problems, depression, anxiety and mood swings, headaches with a stiff neck, dizziness with light and sound sensitivity or other symptoms like resistant insomnia—especially if you have no history of these problems. Such symptoms can occur within 24 hours of the bite, although they might not appear for weeks or months. Illness in humans typically presents with fever, headache, fatigue, migratory pain (muscle, joint, nerve), with sleep and memory/concentration problems. In approximately 50% of individuals, there a characteristic skin rash called erythema migrans. Half resemble a bullseye, and half a spreading, solid rash, that can be mistaken for a skin infection or spider bite. If left untreated, the infection can spread to joints, the heart, and the nervous system. Where ticks tend to hide: They prefer dark warm places like armpits, hairline, groin, waistband, behind the knees, etc. 1. Do a quick check from head to toe. Teammates should assist one another with checking the back side of the body. 1. Take a shower within 2 hours of the round and examine your body in a full length mirror. Check your scalp and behind the ears too. 2. Wash clothes after one use and dry on hot for at least 15 minutes. What May surprise you about Ticks? You can get an infection in as little as 10-15 minutes (Rocky Mountain Spotted Fever, Powassan Virus). Babesiosis, a malarial like parasite, is often transmitted with Lyme, and can cause fevers, day and night sweats, chills, and shortness of breath which require specialized treatment. It is a high probability that more than one illness will be transmitted. Other infections can be serious and life threatening.